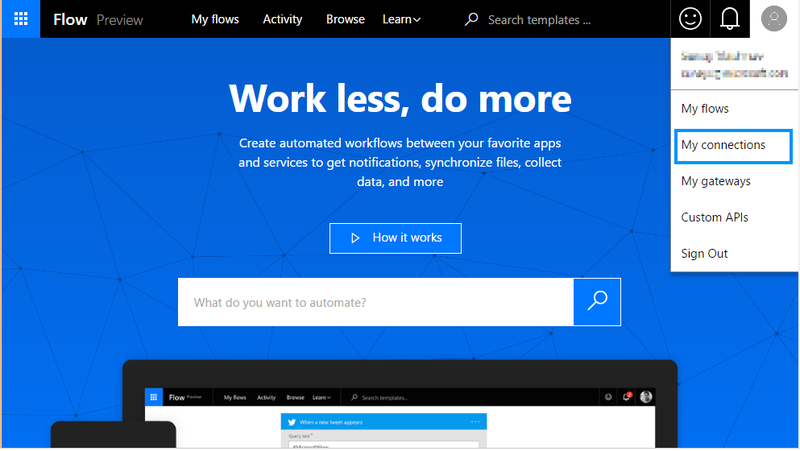 This week, we are excited to announce on-premises connectivity for Microsoft Flow. This can be achieved by using the on-premises data gateway, that allows you to establish secured connections and integrate them with your flows. At launch, the gateway functionality will be supported by SQL Server. As part of our business application platform, this gateway can be used across Power BI, PowerApps, and Microsoft Flow to deliver dashboards, reports, applications and flows leveraging on-premises sources. 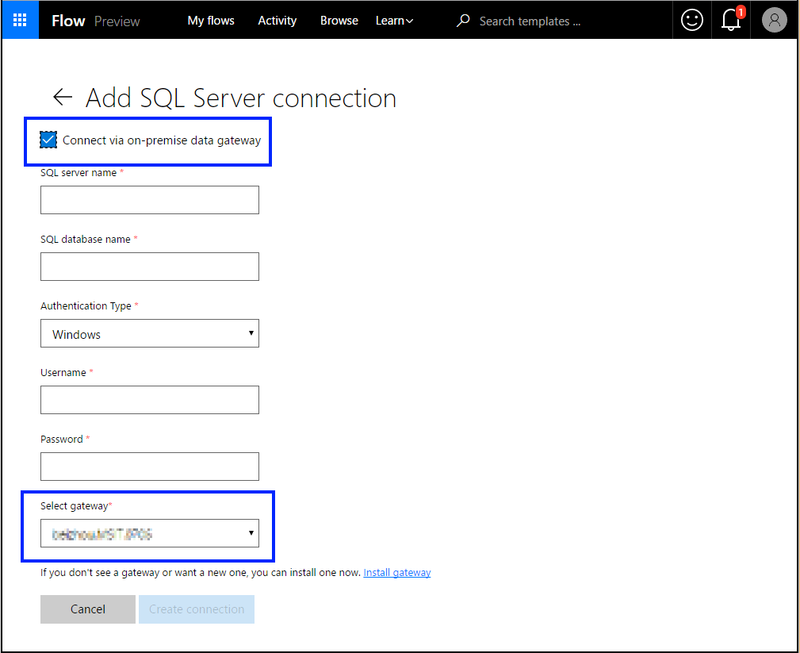 In this blog post, we are going to look at creating a connection to an on-premise SQL database. To start off, you will need to install a gateway on a machine that is in the same network as the SQL server. This machine must be always on and be always connected to the internet. Download the gateway installer and follow the prompts to complete the installation process. When prompted to register the gateway, be sure to use the same credentials, as the ones used to sign-in to Microsoft Flow. Additonal details about gateway installation can be found here. 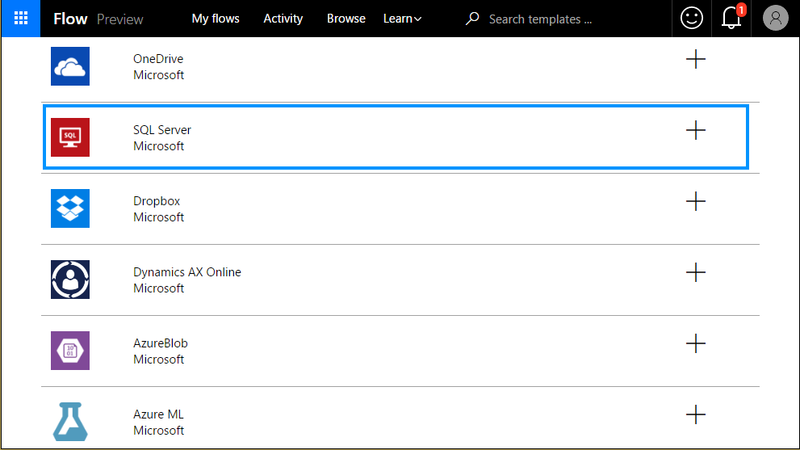 Click “Add a Connection” button in the top right corner and then select SQL server. 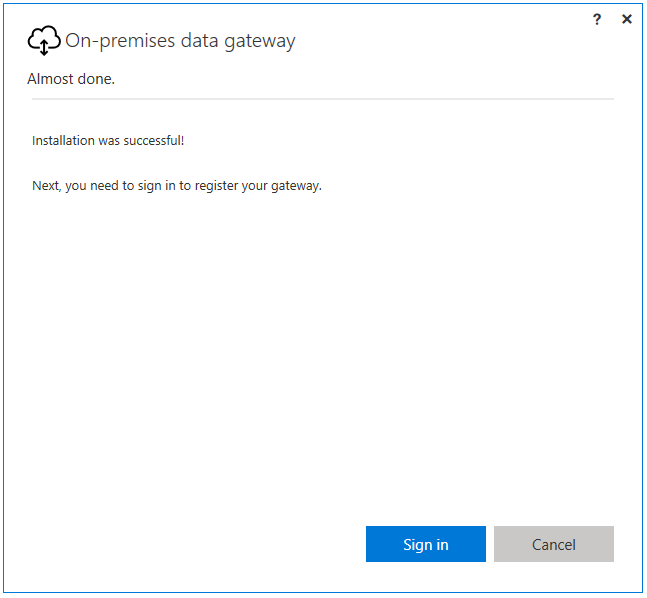 Select the “Connect via on premise data gateway” checkbox. Next, provide the server name, database name, credentials and make sure the correct gateway is selected. After successfully, creating the connection – you should be able to access the on-premise database that you just connected to. You can use this connection, in any other flow just as you would use any other connection. Here are some SQL server templates that you can use right now. Let us know how you are using Flow in the comments section below. Follow us on Twitter to keep up with our latest updates and to learn more about how you use Flow to work smarter.